Governor Andrew Cuomo at the State of the State address in Albany, New York on January 8, 2014. Governor Andrew Cuomo likes being seen as progressive. So despite the fact that he’s really more of a centrist champion for New York’s business community, he used his State of the State address on Wednesday to plug the limited legalization of medical marijuana, a policy he rejected as recently as last year. The oft-rumored 2016 presidential candidate now wants twenty hospitals to experiment with prescribing the drug under strict parameters. You could say that Cuomo’s move—which consists of an executive order that should make pot available to those suffering from cancer, glaucoma and a few other diseases that are “life- or sense-threatening”—is an admirable nod to studies that indicate these patients can gain relief from the occasional toke. But given that the most pernicious effect of the state’s drug laws remains the extraordinary volume of low-level marijuana arrests—an expensive habit Cuomo has made noise about correcting in the past—his new executive order is most noteworthy for what it does not do. It fails to decriminalize “open possession,” the Empire State paradox wherein pot possession has been decriminalized, but only behind closed doors; having weed in public view is still a no-no. This usually crops up when young people of color are asked to empty their pockets by police (yes, even now that the NYPD has reduced the frequency of stop-and-frisks); in 2010, the state arrested more than 100,000 people for marijuana possession, leaving more reactionary destinations like Texas in the dust. 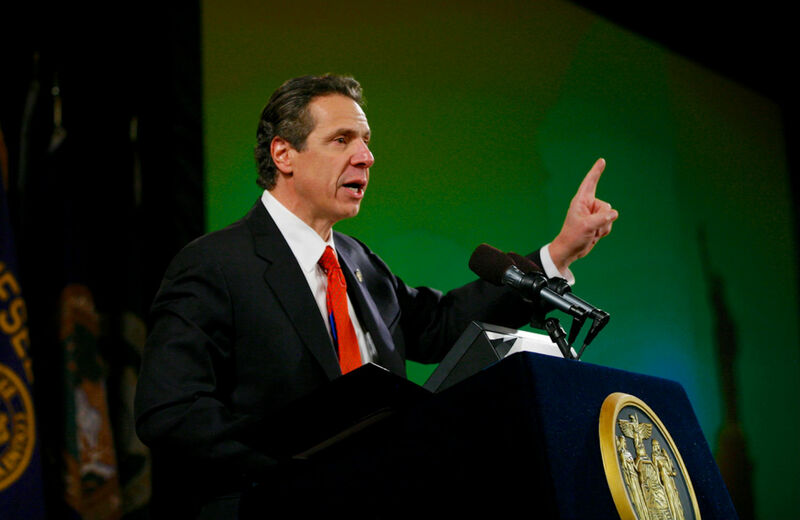 “For Cuomo to back away from that issue, it’s disgusting, frankly,” says Gabriel Sayegh, executive director of the New York State chapter of Drug Policy Alliance, who is careful to express gratitude for the governor’s evolution on medical marijuana. So while this conservative gesture is unlikely to cost Cuomo any votes upstate or in the suburbs, where a tight cap on property taxes and other neoliberal policy innovations have won him tremendous favor in traditionally Republican territory, it fails—like the rest of his speech—to address the needs of the urban residents who make up the core of the national Democratic Party base. And really, isn’t that what this pot gambit is all about? Certainly the timing is right for a conspicuous tack leftward given the ascendance of New York City Mayor Bill de Blasio, who was recognized with generous applause a few minutes before Cuomo stepped up to the podium in Albany. While the prospect of an epic ideological showdown between the two former colleagues—Cuomo was de Blasio’s boss at the Department of Housing and Urban Development in the 1990s—is overwrought, there’s no denying the sharp contrast at work here, and the need for Cuomo to avoid becoming a symbol of the Democratic Party’s past. This medical marijuana plan seems to represent his effort to bridge the chasm between his own approach and de Blasio’s—as well to reconcile his economic philosophy and the populist fervor still raging throughout the progressive grassroots. Just days after Coloradans began legally selling weed at state-sanctioned dispensaries, this governor wants to get in on the action, never one to leave potential tax revenue or business owners (or, for that matter, a political constituency) on the table. His budget, loaded as it is with tax cuts for the rich, is defined by a steadfast refusal to enshrine any kind of surcharge on the wealthy, much less permit de Blasio to levy a new one to pay for his social programs in Gotham. So even if legalization advocates are pleased with the governor’s about-face on medical marijuana, they can’t help but wonder whether he plans on using this modest concession to duck the bigger picture—and gain plaudits from the editorial pages for a no-brainer move in the meantime. “What he really should be doing is announcing that he will work with the legislature on a more comprehensive bill,” says State Assemblyman Richard Gottfried of Manhattan, medical marijuana’s biggest booster in Albany. “He has not said that yet.” Not publicly, though I’m told the governor has privately acknowledged the need for statutory changes, as his executive order will rest on a shaky legal foundation. Whether he goes to bat for meaningful marijuana reforms in the weeks and months ahead will offer some indication not just of what New York residents can expect in the way of drug policy, but also, perhaps, whether their governor—who until a few weeks ago hadn’t spent a single night out of state since taking office—will be journeying westward more often come 2016. Jarrett Murphy is blogging Bill de Blasio’s first 100 days as mayor of New York City here. Matt TaylorMatt Taylor is a Brooklyn-based writer whose political reporting has appeared in Slate, Salon, The New Republic, NYMag.com, Capital New York, The Atlantic, The American Prospect, and Vice, among other publications. You can follow him on Twitter @matthewt_ny.